We were one game away from exiting the postseason's second round with pretty much nothing but traumatic memories. There were the Embiid Dunks of Death in the unmasked grills of Aron Baynes and Al Horford, sure, and the Marco Belinelli confetti shot at the end of regulation, but those were surrounded by so many memories of unforced turnovers and other catastrophic late-game breakdowns that it'd take years of distance to remember them all that fondly. We needed something more to be able to take from this series, an easily understood feel-good moment or story -- a big moment or breakout performance, to enter Sixers playoff lore for all time. We needed the T.J. McConnell game. We learned we'd get some variety of T.J. Game about ten minutes before tipoff, when the Arizona point guard was announced as a surprise starter for their do-or-die Game Four against Boston. It felt a little like a panic move -- especially with McConnell replacing the mini-slumping Robert Covington, always an unfair scapegoat for the Sixers and their fans -- but maybe a necessary one, given how much better the Ballers have played all series with T.J. on the floor, a +20 even across the Celtics' three wins thus far. With no more room for error and not all that much left to lose, it seemed like it was at least worth a shot. The adjustment was 6'2" of one, half a dozen of the other for most of the first half -- McConnell had a couple baskets, some nice hustle rebounds and one gorgeous pass to Ben Simmons in transition, but the Sixers' offense was still pretty lethargic and Philly was pretty lucky to enter halftime up by four. But in the second half, T.J. proved a revelation. McConnell attacked the basket relentlessly, skying for boards and generally dragging the Sixers out of the muck of the Celtics' D. He ended with a career-high 19 points -- how the hell did he never get 20 in the regular season, btw? -- to go with seven boards, five assists against zero turnovers, and one 103-92 playoff win. The crazy thing about McConnell's performance was just how unprepared the Celtics were for it. When he attacked, it was like Boston had never before had to deal with a player who drove to the basket and actually intended to maybe score while doing so. T.J. was able to find the little holes in the C's defense that have simply been unavailable to the rest of the team this series. His nine buckets on the night probably included at least five or six of the ten easiest hoops the Sixers have gotten against Boston all playoffs. It's as if the Celtics built their defense so explicitly to handle the freakish size and imposing physicality of Philly's elite players that they're totally unprepared for a termite like Timothy John. Not just a one-way effort from McConnell in this one, either: We badly needed his peskiness to help put a lid on Terry Rozier, and that's what he did last night, with Rozier struggling to get loose all night. He only scored 11 points, and perhaps more tellingly, he only took 11 shots, and handed out just two assists -- essentially neutralized for most of the game, for the first time in the series. And of course, if the third phase of NBA basketball is in crowd work, you know McConnell did his hyping duty there, even hitting 'em with the TAKE A LOOK AT THIS HAND celebration in the second half. It was cool. Does it make a difference in the grand scheme? Well, I'm not convinced this necessarily means a ton for the series' final result -- they'll have to win one in Boston before I really believe they have a chance to still be a threat -- but I think it makes a difference to keeping this team together and focused long term for them not to get totally embarrassed in this series. To have one game to truly celebrate with their home crowd, and to be able to put it on the shoulders of one of their most beloved teammates. To see even Markelle Fultz beaming like an older brother proud to get to embarrass his little bro about his big moment -- about the guy who essentially took his spot this postseason, may recall -- tells you pretty much everything about what the T.J. Game means to this team. Can't forget how huge this is for McConnell himself, too. He entered this postseason all but out of the rotation, replaced towards the end of the regular season by an emerging Markelle Fultz -- a development which McConnell was, unsurprisingly, a total pro about -- but his energy and gritness have proved irreplaceable in these playoffs, and last night we saw just how valuable he can be on the biggest stage. 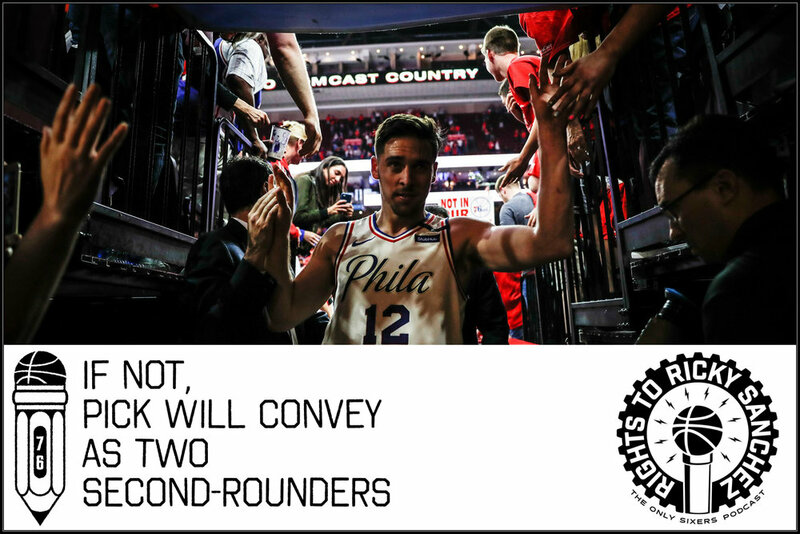 T.J. was no doubt hoping a couple other teams were watching, too: while the Sixers have a club-option for McConnell next season, beyond that he might be up for more of a raise than the Sixers can afford to pay. If the team can't work something out with him to stay beyond next year, I hope he gets himself an Evan Turner contract somewhere else. He's earned it. And finally, this was overdue for the Process Faithful as well. If the Sixers have to lose this series as a learning experience, and to not jump too many levels at once in their evolution from doormats to contenders, ultimately that's fine -- but we didn't deserve to come away from this series with nothing but the stinging reminder of what it's really like to be a Philly sports fan. (We remember, we remember.) We needed something for our troubles, our suffering, and that something was undoubtedly the T.J. McConnell game. Now no matter what happens in Game Five, we just might die with a smile on our face after all. By the way, if you are Team Let's Talk Ourselves Into Actually Being Able to Win This Series Now, no shame, and I'll offer this in solidarity: The Sixers went just 7-26 from three, and still scored over 100 points (in regulation) and won the game. The Celtics have largely won in this series by shutting off the Sixers' three-point shooting, particularly in transition, but this was the first game that the Sixers really proved they could score consistently -- particularly down low in the paint, where they dwarfed their scoring total from the previous three games -- even with Boston strangling 'em beyond the arc. That means for the first time this series, it'll be on the Cus Crises to make the adjustments for Game Five. And then, well, we'll see.